The game field consists of two washer pits, each containing one recessed cup of 4 inches in diameter (101.6 mm) positioned a specific distance apart, toward which players throw washers to score points. The official distance, from cup centers, is 25 feet (7.62 meters). Washers is a game of skill, similar to Horseshoes, in which individuals or teams compete against one another in an effort to be the first to reach a winning score of 11, 17 or 21 points. 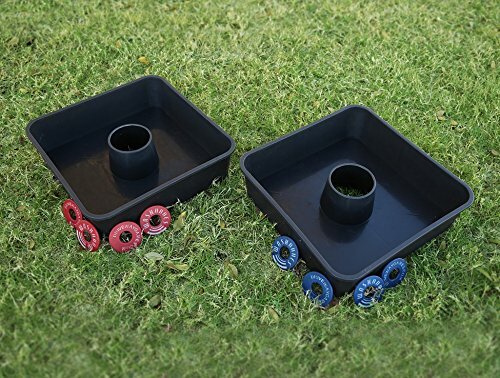 The game consists of two washer pits located opposite one another, each with a recessed cup and 8 foam washers (4 red and 4 blue) total box dimensions: (14.5" x 14.5 x 4.5"). INFINITE FUN - Washer Toss is an exciting team game that is perfect for children and adults alike. Have fun tossing the washers towards the Target (like horseshoes but safer) with your family! Perfect for outdoors use in winter, summer, spring and fall! BUILD HAND EYE COORDINATION --- With this washer toss sports game, the children can improve their hand-eye coordination while the adults have good exercise. Sweat up the fun! WASHER TOSS IS A GAME OF SKILL--- Similar to Horseshoes, in which individuals or teams compete against one another in an effort to be the first to reach a winning score of 11, 17 or 21 points. The game consists of two washer pits located a set distance from one another, each with a recessed cup. PREMIUM QUALITY--- Use the red and blue washers and pitch them at the opposing tray. The closer to the center the more points you get.